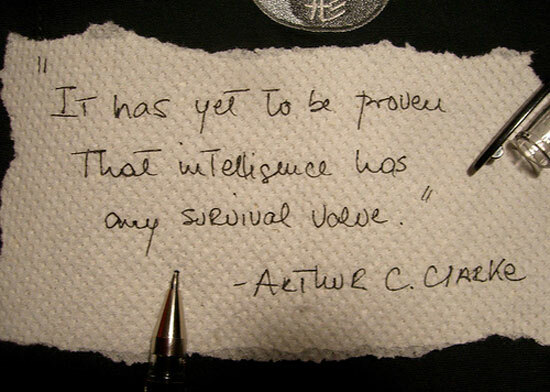 Writing on napkins saves me time! Society tends to have narrow views of its scientists, especially the brilliant ones. It assumes they are consumed by science and spend most of their time with microscopes or scribbling equations on dinner napkins as Einstein once did. I’m addicted to writing on dinner napkins. I scribble on them all the time as I’m holding a conversation with someone. I have been doing this for the last 25 years. Why do I scribble on napkins ? I think that it is because it saves me a lot of time when I communicate with others. It helps me organize my thoughts as I speak with someone. When I organize my ideas as I speak, I believe it reduces my natural tendency to ramble on forever. Notice that when someone starts to repeat himself or herself, it is because he or she made her point already. In sales, we call this “Overselling”. The “napkin method” should help some of you to get to the point faster. The scientific method is all about organizing our thoughts, our results to insure repeatability and make sure that we separate facts from personal opinions. Writing on napkins is simple, practical,spontaneous and it helps you organize your ideas. Thank you for the information. Have a great day Joanne.